It is possible to visit Israel on a tight budget and here we’ll show you how. Israel is the bridge between Europe, Africa, and Asia, the place where levels of service, culture, language, food, and so much more meets. It is a country with fascinating sites and a place which is great to explore whether you want to splash out on luxury or have a tighter budget. From amazing markets to fantastic low-cost accommodation, and great tours geared up for budget and independent travelers, exploring Israel on a tight budget is pretty easy. Here are 10 ways to see Israel on a budget. Whilst food in supermarkets and restaurants is comparable in price to what you would pay in Europe, every major city in Israel has a major market (a shuk) where you can buy food, particularly native foods, for ridiculously low prices. The main market in Jerusalem, the Machane Yehuda Market is a maze of hundreds of stalls selling pretty well anything conceivable, at amazingly affordable prices (and, of course, there’s room to haggle). Tel Aviv has the Carmel Market, whilst pretty well every other town or city in the country has something similar. 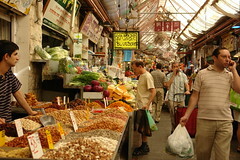 Check out our articles about the best markets in Tel Aviv and best markets in Jerusalem for more information. Hostels don’t usually at first sound like the place you would like to spend your vacation, but Israel has a growing breed of hostels which are leading the region (and in cases, the world) as models. You’ll find urban hostels offering top-quality accommodation with an unbeatable atmosphere for a fraction of the price of hotels (some of whose accommodation is even more basic than the hostel’s), converted historic buildings, and small hostels in remote corners of the country with amazing standards. Check out our guide to the best hostels in Israel or see a big list of hostels in Israel. Also, see our page about backpacking in Israel. Falafel and hummus are to Israel what pretzels and hotdogs are to America and pasties and sandwiches to England. They are available everywhere, eaten by everyone from construction workers to business-people, and are incredibly affordable costing as little as NIS 10 in some areas. It’s amazing value and you can be pretty certain that it’ll taste good. Because Israel is such a melting pot of cultures, there are other popular street foods which are available everywhere including Bourekas (fine pastry filled with different fillings), Schnitzel, and Shwarama. Getting to Israel cheaply can be a challenge at certain times of the year, but there are more airlines than ever flying to Tel Aviv including a large number of low-cost European airlines. There are bargains to be had, whether you are flying from the US or Canada, Europe, or elsewhere if you search around and are flexible. Check out our article about the best ways to get to Israel cheaply for more information. 5. What about a vacation rental? Looking to stay for a while and prefer your own place to a hotel? There are hundreds of vacation apartments, particularly in Tel Aviv and Jerusalem where high-quality accommodation comes for far less than the price of a hotel. If there are a few of you traveling together, this is a particularly good option, but be aware that many apartments require you to stay for a week or more. Follow this link and you can search for vacation rentals in Israel. Israel has a very strong public transport infrastructure which is both efficient and affordable. Buses in Israel are modern, clean, and safe, running at good frequencies between and within major cities, and very reasonably priced. Another option is to take sheruts which are shared taxis and also run both within and between cities. The main difference between these and buses is that the driver will stop and drop you anywhere along the route, making them incredibly convenient for some destinations. Read more: public transport in Israel. There are a number of special Israel tours designed especially for budget or independent travelers. Many of these provide the infrastructure and materials for you to explore the sites on your own rather than providing an expensive guide, often making it cheaper to join the tour than explore on your own. There is a growing range of tours, and the most popular remain tours to the Dead Sea, to Masada, and within Jerusalem. You can also take great value tours to Petra. Read our special guide about visiting Petra from Israel. See the full range of budget Israel tours. True, Israel has hundreds of fascinating museums, many of which require you to pay to enter, but remember that particularly when it comes to history, religion, and archaeology, Israel is one big museum. It is often more interesting (and of course, cheaper) to get some good shoes and walk. Making calls within Israel on your international phone will almost certainly be very expensive. To save loads of money, bring an unlocked phone with you and when you arrive in Israel, buy a top-up or pay as you go sim card. Most of Israel’s mobile networks provide them (the two biggest are Cellcom and Orange – who’s scheme is called Big Talk), and you can call within Israel for very little, especially compared to what you would pay from your overseas mobile, a hotel phone, or a phone box. Often changing money in a rush at the airport before you leave for Israel gets you a terrible exchange rate. Obviously, don’t come without any shekels, but be aware that there are change places in the centers of most Israeli cities (and tens of options in Jerusalem and Tel Aviv) who offer competitive rates which are better than you will probably get at home. It also saves you the issue of converting more than you need as you can just convert more as you go along. You’ve now saved so much money that you can afford to splash out – maybe a night at a five-star hotel, a meal at a top restaurant, a luxury experience, or a once in a lifetime experience adventure. Whatever you decide, have a great trip, and share your travel tips below! Have you traveled in Israel on a budget? Share your tips and experiences below for everyone to benefit from!